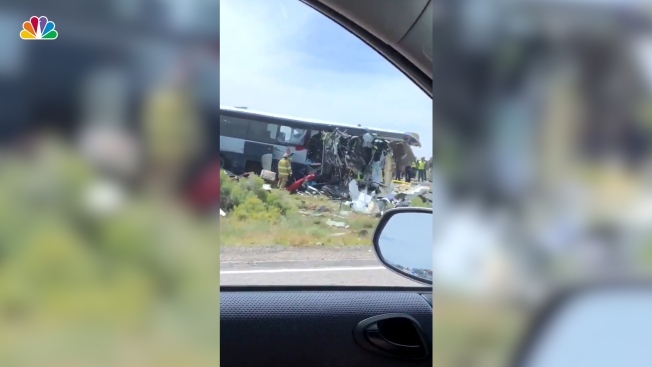 A California-based trucking company and one of its drivers were accused of negligence Friday in a pair of lawsuits as investigators sorted through the wreckage from a deadly bus crash on a New Mexico highway. 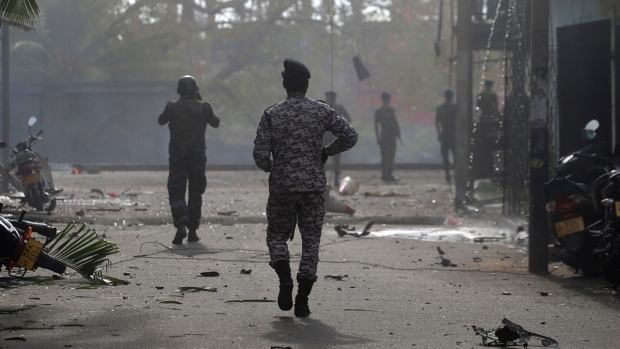 Eight people were killed and 25 injured, including three young children. On Saturday, the Office of the Medical Investigator identified five of the eight people who were killed through fingerprints. Sadie Thomas, 50, Charla Bahe, 34, Terry Mason, 45, Luis Alvarez, 50, and Veronica Jean Williams, 49, all died from accidental blunt force trauma in the crash. OMI is using several identification methods to identify the other three victims, according to Dr. Kurt Nolte, Chief Medical Examiner. The Greyhound bus carrying nearly 50 people was headed west along Interstate 40 on Thursday when a semitrailer going in the opposite direction lost the tread on its left front tire and veered across a median and smashed into the bus, police said. The front of the bus was mangled, the cab of the semi was flipped and the trailer was on its side as debris was scattered across the highway. Passing motorists stopped to help passengers climb out of the wreckage before authorities arrived. New Mexico State Police Chief Pete Kassetas called them heroes, saying some pulled ladders from trucks to reach the bus windows. "For them to stop and get involved is amazing. I commend them," the chief said. "To get ladders, to get into the bus to get people. Can you imagine?" Investigators with National Transportation Safety Board have secured the vehicles for inspection and examined the crash scene Friday. They also will be looking at factors such as driver fatigue, training, safety records and the condition of the roadway. "Unfortunately things of this nature occur and our job is to try to do what we can do to prevent them from happening again in the future," said lead investigator Pete Kotowski. The legal complaints filed Friday allege negligence on behalf of the unnamed truck driver and JAG Transportation Inc. They cite data from the Federal Motor Carrier Safety Administration that shows the company reported three crashes in the last 24 months. Attorney Bryan Williams said there are concerns about proper maintenance and inspection of the truck's tires. A woman who answered the phone at the company's office said no one was available to comment. The plaintiffs are not named but one is from Arizona and the other is from Ohio. The driver of the semi, a 35 year-old man licensed out of California, sustained non-life-threatening injuries. Authorities did not name him, saying he was not currently facing charges. Officials at University of New Mexico Hospital in Albuquerque said nine patients remain hospitalized there, including three adults who are in intensive care, one of whom is in critical condition. Two infants are also in intensive care. Some patients were expected to undergo surgery Friday and Saturday. While doctors declined to offer specifics, they said the patients had injuries that ranged from head trauma to spinal fractures and broken bones. "Several of them will have a long road of recovery ahead," said Sonlee West, director of the hospital's trauma unit. "We have been in contact with family members of several of the patients, and several of them have been able to talk to their families." Other passengers were being treated at hospitals in the Gallup area, about 30 miles (48 kilometers) from the crash site. Greyhound spokeswoman Crystal Booker said in a statement Friday that the company was cooperating with authorities and will also conduct an investigation of its own. "Tragically, a number of people have lost their lives, including our driver, who had 27 years' experience with Greyhound. Our hearts are with all those affected by this incident," she said. Authorities identified the bus driver as Luis Alvarez, 49, of Santa Teresa, New Mexico. A pile of debris remained on the shoulder of the highway Friday, but transportation crews had yet to clear it because it contained evidence and belongings from the bus passengers. People seeking information on relatives who may have been on the bus can call 505-722-2002.